After coming away from a workshop with Ciaran Whyte, I decided to have a go at making a tri-flash hotshoe adapter, seeing as we made so much use of one during the day. 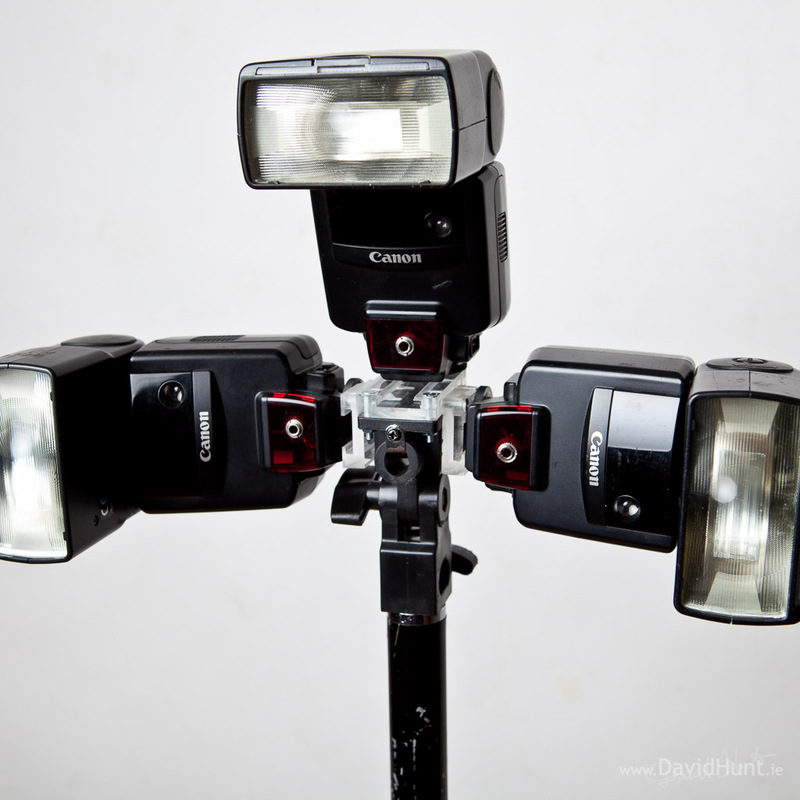 I happen to have 3 Canon 540EZ strobes which I could use. To make things easier to mount, I wanted to trigger all three strobes with a single radio receiver. To do that, I’d have to modify my strobes to give them a sync port. On the strobe on the right you can see the 3.5mm jack socket mounted in the red plastic window. I had to remove some parts of the strobe to make room for the socket, but since I only ever use these in manual mode, they bits I took out are never used. Undoing the 4 small screws at the bottom allows you to remove the hotshoe section of the strobe. Next, we pop out the red window, drill a 6mm hole in it (I used a special acrylic drill bit I had lying around. Using other bits may crack this piece, be careful. Next, we solder two wires from the jack socket to the relevant pins on the hotshoe. In the 540EZ, the ground is the blue, and the trigger is the red. All back together. You might want to test the connections before putting it all back together. Testing the new sync port with a 3.5mm jack to 3.5mm jack cable. The Cactus V4’s have a 3.5mm jack socket on the side. Nice feature. All three 540EZ’s complete, with new 3.5mm jack socket sync port. The 4-way cable saves on radio receivers. I then took the three hotshoe/umbrella adapters I had, and thought about mounting them on the same tripod. The simplest method at hand was two pieces of cylindrical hardwood bolted together into a cross. That way I could put one ‘end’ into the tripod, and put the three hotshoe adapters on the other three ‘ends’. (oh, and I cut the bolt for a neater finish). Twisting the strobes and adapters into the following configuration, I ended up with a pretty neat setup, all triggered off a single radio receiver. I was having problems triggering all three flashes with the single Cactus V4. The refresh times went to hell. One or two flashes, fast recycle time (@ 1/128 power) but with three connected, several seconds. Shown in the above (very messy) circuit is a 3V power supply, two 3.5mm jack sockets (one for trigger, one for flash 4-way cable), a 50 ohm resistor, and a small low-voltage transistor. The theory was that when the trigger closed the circuit, 3 volts would be gated into the transistor, causing the output to short circuit, triggering the 3 strobes simultaneously. This triggering would be electrically isolated from the output of the wireless receiver, so it should recover quicker, allowing me to trigger rapidly in succession, which it was not when directly connected. At least that’s the theory. And low-and-behold, the damn thing worked. There was no-one more surprised than myself. I could now trigger all three strobes as fast as my thumb could press the transmitter test button. No delays from the receiver. Wicked. So I then pulled out an old eBay trigger that no linger worked, mounted all the above circuit into a nice neat box, and got some well earned sleep. Here’s the enclosure showing the batteries, and input and output 3.5mm sockets. I used the existing power switch as well, so the circuit is completely dead unless I switch it on. I’m wondering if I should integrate the transistor and resistor straight into the drigger? Might be a squeeze, but it’s one less set of batteries to be worried about. Maybe it’s not worth the trouble. Anyway, I was happy to have solved my trigger speed issue. I’ve also tested this with a set of borrowed Yongnou RF-602 triggers. These do not exhibit the same issue as the Cactus V4’s, in that I can plug the 4-way cable directly into the receiver and it will trigger all three strobes without any recycle delays. These must have better trigger isolation than the Cactus V4’s. No need for the extra circuit. –Edit– You can add Cactus V5’s to the list that don’t need the extra circuit.